The bottom line…the SCIMPI deployment was a success and there are many very happy and relieved people. Sitting on the ocean floor this morning is the top 18 meters of SCIMPI that will be revisited in about three weeks and connected to the Neptune Canada network. The entire process had its hiccups. 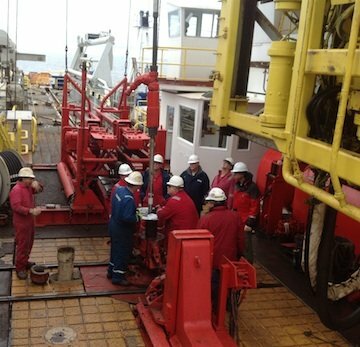 There were some challenges with the release tool that separated the SCIMPI from the logging tool and some problems with the sediments getting into the pipe, but the brilliant minds of the drillers, engineers, scientists, and others onboard identified and implemented ideas that worked. We now have permission to drill a hole about 40/50meters away to collect some logging data. This data will be used to assess if the nine different SCIMPI sensors are placed in the correct depths to record information useful for understanding the gas hydrate formation in the area (and more).